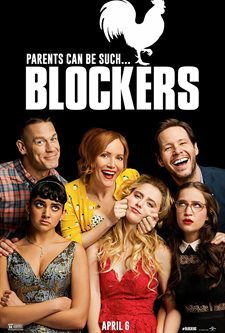 Download Blockers in Digital HD from the iTunes store. Blockers images are © Universal Pictures. All Rights Reserved. Prom night. It's a magical time for teenagers all over the country. They party, dance, do things they shouldn't be doing and plan for a special night they will never forget. For some that includes losing their virginity. It's a "rite of passage" many partake in before they graduate from high school and head off to college and one many parents dread. What happens though when those same parents find out about their children's plans and do their best to prevent things from going too far? The result is a hilarious, new comedy from the writing team of Brian and Jim Kehoe (Overachievers) called Blockers. Julie (Kathryn Newton; Lady Bird), Kayla (Geraldine Viswanathan: EMO The Musical), and Sam (Gideon Adlon; American Crime) have been best friends since grade school and are excited to enjoy their prom together but imagine Kayla and Sam's shock when Julie reveals to them that she plans to sleep with boyfriend, Austin (Graham Phillips; The Good Wife), that night. As she tells them all the reasons why Julie convinces Kayla to do the same and gets Sam thinking and the three make a pact to lose their virginity on the same night. Julie's Mom, Lisa (Leslie Mann; Knocked Up), Kayla's dad, Mitchell (John Cena; Trainwreck) and Sam's Dad, Hunter (Ike Barinholtz; Suicide Squad) find out about the girls' pact and Lisa and Mitchell begin a manhunt to stop their daughters while Hunter tags along to try and stop them from embarrassing themselves and the girls. During their "chase" they learn a lot about themselves and their relationships with their daughters. In the end, the girls each find their own truth and the parents find themselves closer to their offspring than ever before. While the movie has elements that scream classic Hollywood formula, my initial thought as the film ended was, "it's not your typical ‘coming' of age story" (This sentence will make more sense once you have seen the movie). Yes, it is about prom and finding sexuality it is also about the parents and the emotions they are dealing with as their children become adults and head off to college. This is all done with humor and physical comedy that serves the plot well. The script is also well written for the most part which doesn't always happen in these types of movies. The cast is well chosen and play their parts perfectly. I am typically a fan of Mann's work and this movie showcases her well-honed comedic skills. Cena does a good job as the straight man who is just a little too uptight and emotional for his own good. I think this is one of my favorite parts of his to date. Barinhotlz plays the goofy dad which is a little bit of a departure from some of his previous roles but he makes it believable. Newton, Vishwanathan, and Adlon have good chemistry and blend well together. There are some very funny gags in this movie that had the audience laughing out loud including me (and I generally don't like slapstick comedy as a rule). There is also a hint of realism with a teenage daughter who will be soon heading off to college (like me). I give the Kehoe boys credit for entertaining us and taking a usually serious topic and adding some levity to it. Overall, some good performances, a decent script, and a mildly different plot makes this film worth seeing.